The development of civilization is closely connected to the discovery of metal. The first metals known by prehistoric man were found in natural state, they were soft and pliable and could be shaped into many forms and had a low melting point, copper was probably the first. 13,000 years B.C. they were already using primitive tools and weapons made of copper; about 3,000 years B.C. the Egyptians built canals and pipes made of copper, 1,000 years after they learned how to merge it with tin creating bronze. Also gold and silver were known metals used thousands of years ago. Metals with a high melting point such as iron entered the scene about 7,000 years before furnaces capable of reaching temperatures close to the melting point were available. This implies that, objects made of iron were built using “powder metallurgy“, which was introduced by the Egyptians about 5,000 years ago. The oxidized iron was heated in the coal fire‘s atmosphere, and thereafter, the resulting porous metallic iron was hammered into the desired shape. This method was used 1,600 years ago, with this approach statues and colums weighing more than 6 tons were built, such as the pillar of Delhi. In the 19th century fast development followed by fast disuse of “powder metallurgy” was recorded. The method of hot pressing platinum was developed in the 1800’s: the pressing of platinum powder heated in a clay melting pot; in 1882 a variant of this process was prepared with bars weighing more than 15 kg. In 1830 copper bars were prepared by pressing and sintering powders obtained by the reduction of oxidized copper. 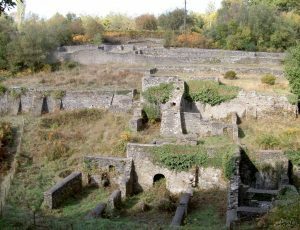 Then, in the mid 19th century, melting furnaces, whose prototypes were developed about 200 years ago, improved so much that they lead the metalworking industry towards smelting techniques and “powder metallurgy “was almost completely abandoned. In 1850 carbon steel was the best material for creating tools. But the tool life was very short and the execution irregular. Reliable thermal treatments had not yet been developed and any method capable of improving the tool was considered a secret of the user. Dark Hill Ironworks factory ruins; here Mushet produced for the first time the alloy with steel and tungsten. In 1860 Robert Mushet developed an alloy which contained tungsten: this was the first type of fortified steel and its introduction in the industry allowed double cutting speeds of cast iron. In the 1900‘s the heat treatment of this steel containing small amounts of chromium and manganese in addition to tungsten, was further improved and the industry could use a steel capable of working at high speed: chippings were blue and the tool turned red due to heat produced during work. In 1915 Stellite and Tantung fused alloys were introduced, mainly consisting of cobalt, chromium and tungsten. These alloys were as hard as steel, maintaining their hardness in heat and greatly increasing the life cycle of the tool at speeds of up to 50% higher than before. It’s the era of “cemented carbides” and it is interesting to see how this “metal” revolutionized the industry of processing plastic and made the mass production we know today possible. 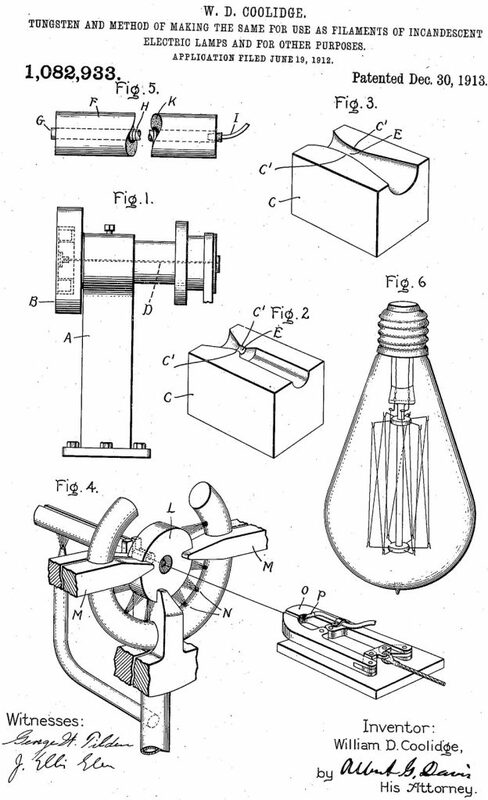 In 1879, Thomas Edison built the incandescent light bulb using carbon strands made with Japanese bamboo. He confirmed that tungsten strand would have improved properties, but at that time only chemical tungsten powder was available. In the early 20th century the great French physicist H. Moissan built the first electric arc furnace, in order to melt tungsten, but the carbon electrodes reacted with the tungsten to form tungsten carbide and Moissan considered the experiment failed. However using the same method he prepared carbides of all refractory materials and studied their physical and chemical properties: his research was so complete that even today very little has been added to the knowledge of these materials. Carbon has the highest melting point among all the elements and Tungsten the second highest, the only possible oven capable of melting the tungsten is the “coal oven”, but since the two elements react with one another to form carbide, it appears that it is impossible to melt tungsten in an oven. This limitation led to the revival of “powder metallurgy” and progress was stimulated by the industries demand of ductile tungsten. The sintering process patented by Schroeter in its essence is still the production method of “hard metal”. The discovery of Schroeter marked the beginning of a new industry which subsequently has developed all around the world. Up to the 1950‘s the progress of this industry has been relatively slow, then the evolution of cast iron and steel and a better knowledge of refractory materials has encouraged the development of “hard metals” in many industrial fields. The various qualities of “hard metal” processed have allowed the metal processing to achieve results not reached before with the use of traditional materials.